Motherwell manager Stephen Robinson has hit back at Celtic manager Brendan Rodgers by defending striker Ryan Bowman against accusations that he's a dirty player. ‘Life threatening’ was the Rodgers verdict on the Bowman challenge which left Rangers defender Fabio Cardoso bloodied and with a broken nose during the Steelmen’s 2-0 Betfred Cup semi-final win on Sunday, potentially stoking up tensions ahead of the Hoops’ final against the Lanarkshire side on November 26. No foul was given by referee Steven McLean but fears that Bowman could face a retrospective SFA charge and potential ban from the final were quashed this afternoon. Celtic gaffer Rodgers blasted: “The centre-half came off the pitch on Sunday . . . Christ, if he’d been shot, he wouldn’t have looked worse. “I can see why Pedro (Rangers boss Caixinha) would have been annoyed — absolutely. “You are endangering players’ lives and careers with some of the challenges we saw. “It was the same player (Bowman) who tackled Kieran (Tierney, Celtic defender) last season and it went unpunished. “There was a couple of decisions on Sunday that would’ve worried me. “I thought the authority from the officials in the game was poor. “It’s also the welfare of players you are looking at. “We all want our team to be aggressive and committed but you also want officials to stamp out anything that goes beyond that and I felt Sunday lacked authority in terms of officiating. “You have to make it as uncomfortable as you can for the opponent but if it goes beyond that and it becomes reckless and you are endangering an opponent, then you have to look at it. 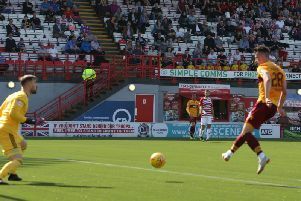 But any worries Motherwell had about a retrospective ban from the Betfred final for Bowman were eased today when SFA compliance officer Tony McGlennan deemed the flashpoint with Cardoso worthy only of a yellow card because it was a reckless challenge. You can’t retrospectively dish out a yellow card – just a red. It means the only action coming out of the fiery encounter will go to Bruno Alves after the Ibrox defender was handed a two-game ban for striking out at Louis Moult. Speaking at a press conference today, 'Well manager Robinson hit back at Rodgers by sticking up for former Gateshead striker Bowman, pointing out that the 25-year-old Carlisle-born attacker has only been booked three times in 46 matches since joining Motherwell in August 2016. “Ryan Bowman is a boy who’s come from non league,” Robinson said. “He’s finding his way in the game. He’s absolutely distraught this morning with certain comments. “Over a five-year span in Bowy’s career, he’s been booked I believe nine times. So that does not suggest that he’s a dirty player. “He’s a boy that gives absolutely everything. There’s other players in the league who play in the same position who have been booked twice as much over the same time frame.